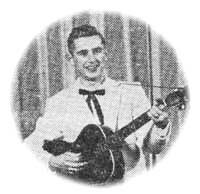 Tommy played guitar and sang on "The Red River Jamboree" out of Paris, Texas over radio station KFTV that broadcast on Saturday nights from 8 to 11pm back in 1957. At the time, this singer from Trenton, Texas had a record contract pending. Cowboy Songs Vol. 6, No. 54, December 1957; Americn Folk Publications.